Never Enough Nails: Mint Chocolate Chip Ice Cream! When I started this mani, I actually intended to add white glitter also. 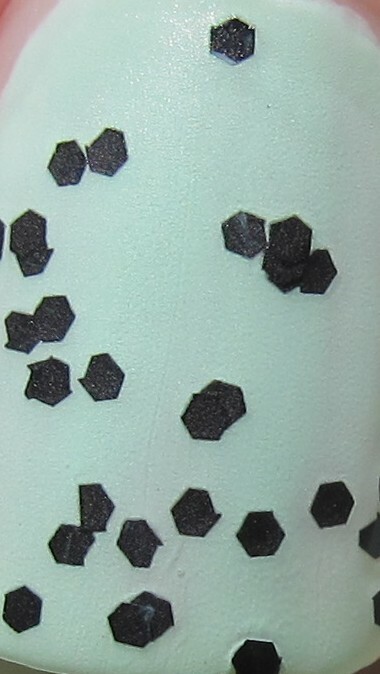 BUT, I saw how the minty green (China Glaze Re-Freshmint) and black glitter (Wet n Wild Tangled In My Web) was looking like mint chocolate chip ice cream, and I had to stop there. You see, mint chocolate chip is my FAVORITE ice cream flavor!! Yummmmmmmm! This is two coats of CG Re-Freshmint, one coat (with some assistance) of Wet n Wild Tangled In My Web, and one coat of KnockOut Cosmetics Flatte Top, a matte top coat. I think the matte top coat really made it look more like ice cream. This look is really fun, I highly recommend you try something similar with any mint green polish and black glitter polish! This mani also made me think, why don't more companies make black glitter polishes? They rock! And what awesome stuff is Wet n Wild going to do this Halloween?? Thanks ladies! I am having fun wearing this! It's actually lasting a long time with no chips too!